Remembering Shakespeare draws on the Shakespearean collections, in print and manuscript, across Yale University’s institutional holdings, in particular those of Yale’s Elizabethan Club, Lewis Walpole Library, Yale Center for British Art, and the Beinecke Rare Book and Manuscript Library. But another concurrent exhibition, “Yale’s Shakespeareans,” on view in Yale University Library’s Memorabilia Room, documents Shakespeare particularly at Yale, in the curricula, performances, and collections of its faculty and students over centuries. 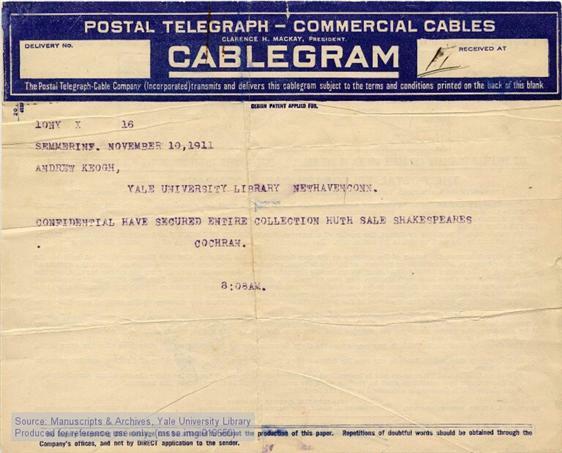 “Confidential have secured entire collection Huth sale Shakespeares,” writes Yale graduate Alexander Smith Cochran (BA, 1896) in this cablegram to the Yale University Librarian, Andrew Keogh. The Henry Huth collection of early printed editions of Shakespeare’s plays was to form the cornerstone of the extraordinary collections of Yale University’s Elizabethan Club, which Smith Cochran founded in 1911. Apart from going to New Haven, are there printed books with these illustrations? I truly enjoy this site and thank you for this.